This is for the Life Purpose Reading). Click the "Add to Cart" button to purchase. If you do not wish to purchase over the internet, please order via email at fantasypopart@hotmail.com. Video reading format. 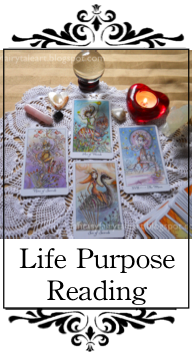 A reading that addresses ones purpose in life. Are you living up to your life's purpose? This four card spread will guide and help you to know if you are living up to your full potential. 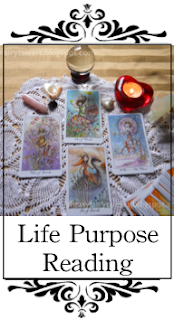 Addressing you, your personal life purpose, family & friend purpose, and your world purpose. Reading takes 20 - 30 minutes, but can vary. Please include in the "checkout box" your name, email, and any information one might want to share. You may choose to send an image of yourself as well to Julia's email, which can help connect intuitively. Please allow 3-5 days for reading. Payment due at checkout.